3DTV is hitting the UK earlier than expected, with a football (translation: soccer) match screening this Sunday. 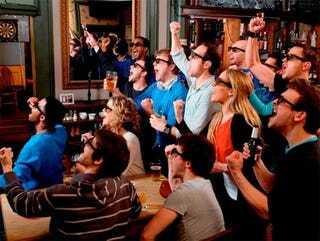 It'll be the first sports event broadcasted in 3DTV, and will be on show in nine pubs (translation: bars) across the country. Sky's actually launching their 3D channel properly in April, with this Sunday's Arsenal vs Manchester United match being the first stop-off on the multi-dimensional tour. It'll mostly be of use to pub-goers, with few people expected to be snapping up the first wave of 3DTV panels when they go on sale, but Sky's 3D service will be available to all Sky+HD box owners.